Wetlands provide significant environmental services, including pollutant assimilation, flood water storage, carbon sequestration and fish and wildlife habitat. Geographically isolated wetlands, also called ephemeral wetlands, perform many of these services, and support remarkably diverse communities. The periodic drying of small isolated wetlands excludes predatory fish populations, making them especially valuable breeding habitat for amphibians and invertebrates. In Florida, 14 species of amphibians breed exclusively in isolated wetlands. It is often difficult to map isolated wetlands because they are relatively small, often occur under tree canopy and may remain dry for extended periods. 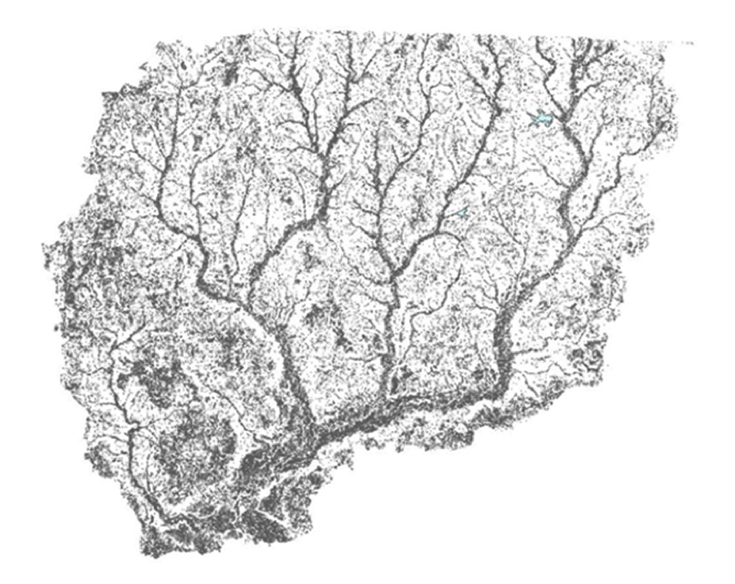 A predictive algorithm (maximum entropy using a program called Maxent) was applied to environmental variables derived from multispectral remotely sensed data and GIS data to approach the problem of detecting wetland areas absent from the National Wetlands Inventory (NWI) layer in the watershed that contains the bulk of the Blackwater River State Forest. 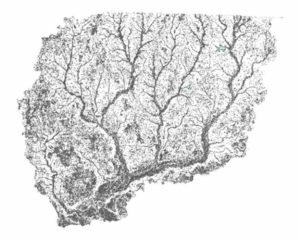 An elevation map created from Lidar (Light Detection and Ranging – a tool using a laser to collect extremely detailed elevation data), was used to identify low areas (sinks) in which water is likely to collect. Several Maxent modelling runs were performed in order to identify the combination of environmental variables with the least correlation that would result in the simplest model while preserving a high information content. Because Maxent produces a continuous probability distribution, a binary threshold was produced to conduct an accuracy assessment. The threshold was applied at 0.3517, derived from the mean of all sinks falling within known wetlands. Twenty percent (2278 of 11389) of the sinks that fell outside of known wetlands were randomly selected for accuracy assessment via current and historic (to 1994) Google Earth aerial photographs. Based on model evaluation methods, the final Maxent model was considered an “excellent” model fit. At the selected threshold, 120.5 km2 of 1848.4 km2 were predicted to be wetland areas. The accuracy assessment yielded an overall accuracy of 0.90, with 1257 points being wetlands, 142 points falling outside of wetlands and 881 points impossible to classify from the photographs.